Samadhi, which is the limb of contemplation. The goal of Ashtanga yoga is to not only conduct and hold different series of body positions, intended to restore and maintain a practitioner's well-being and improve the body's flexibility and vitality. Ashtanga yoga focuses on harmony of movement and breath, into the dynamic and continuous flow, where body postures come only secondary. Practitioner should remain focused on nose breathing, which needs to be free, flowing and relaxed. The positions are held for a certain number of breaths, while the transitioning between postures also accompanies inhales or exhales. The most important thing is to keep breathing rather than trying to keep the body in a perfect position. 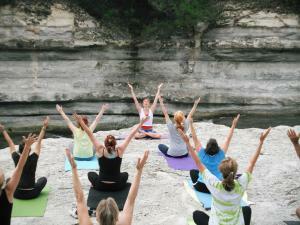 Ashtanga yoga teachers commonly stress that there is no such thing as a perfect pose. Each body is different and we are all looking different in the same yoga position. The goal of the exercise is to feel the friction in the muscles, feel the stretch, continue breathing and remain focused on the activity. According to the Ashtanga yoga teachers, if one breathes correctly and challenges oneself in a posture, the class is done perfectly. One of the commonly used techniques of Ashtanga Yoga is Vinyasa, which is a variant of Sun Salutation, commonly used in other types of Yoga. Vinyasa is the linking of the body movement with breath, in a specific breath-sequence synchronized with movements used to transition between two postures. This flow starts from the Plank posture: the shoulders are over the wrists and the whole body is in one straight line. The plank continues by pressing the forearms and hands firmly down, while pressing back through the heels. The neck is in line with the spine, and shoulder blades are broadening. From the plank, the practitioner goes to Chaturanga, which looks just like a pushup, since the body is lowered toward the floor, and stopped when the forearms and upper arms are at a right angle. From Chaturanga, the body flows to the Upward Facing Dog by coming forward by rolling over the toes without letting the thighs touch the floor. normal life after anterior cervical fusion?